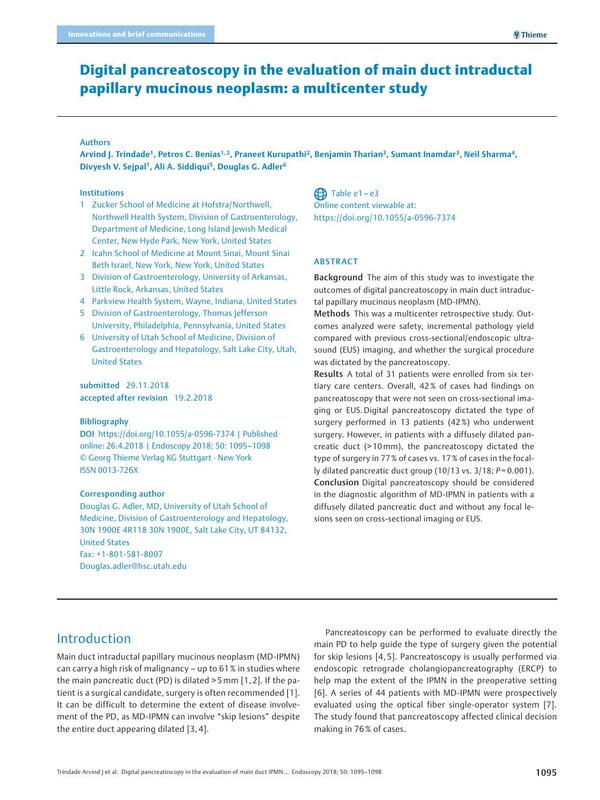 Background The aim of this study was to investigate the outcomes of digital pancreatoscopy in main duct intraductal papillary mucinous neoplasm (MD-IPMN). Methods This was a multicenter retrospective study. Outcomes analyzed were safety, incremental pathology yield compared with previous cross-sectional/endoscopic ultrasound (EUS) imaging, and whether the surgical procedure was dictated by the pancreatoscopy. Results A total of 31 patients were enrolled from six tertiary care centers. Overall, 42 % of cases had findings on pancreatoscopy that were not seen on cross-sectional imaging or EUS. Digital pancreatoscopy dictated the type of surgery performed in 13 patients (42 %) who underwent surgery. However, in patients with a diffusely dilated pancreatic duct (> 10 mm), the pancreatoscopy dictated the type of surgery in 77 % of cases vs. 17 % of cases in the focally dilated pancreatic duct group (10/13 vs. 3/18; P = 0.001). Conclusion Digital pancreatoscopy should be considered in the diagnostic algorithm of MD-IPMN in patients with a diffusely dilated pancreatic duct and without any focal lesions seen on cross-sectional imaging or EUS.